Arapahoe Square has unlimited potential for redevelopment and revitalization. One of the seven transformative projects outlined in the 2007 Downtown Area Plan is the strategy to establish Arapahoe Square as Downtown’s new neighborhood. Located southeast of the Ballpark neighborhood and just north of the Commercial Core, Arapahoe Square is one of the most underutilized areas of Downtown. 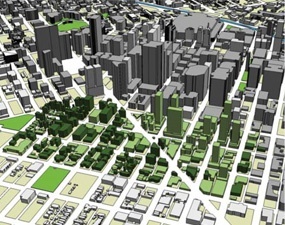 In turn, it perhaps has the most potential for redevelopment and revitalization in the coming years. Arapahoe Square is situated between the high-rise development of the Commercial Core and the lower-density neighborhoods of Curtis Park and Five Points. The southwestern edge of the district is 20th Street, which is heavily traveled by automobiles going towards I-25 and Coors Field. The northern edge of the district is Park Avenue. It transitions to Ballpark to the west and and Uptown to the south. Broadway bisects the district creating the triangular building sites where the two grids intersect. Arapahoe Square holds vast unrealized potential. 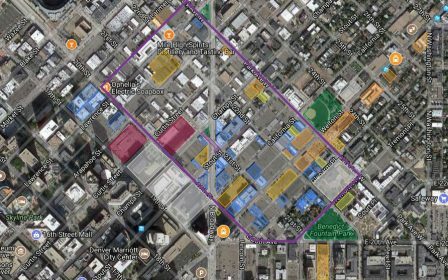 Its proximity to other Downtown districts and the historic neighborhoods to the northeast makes it an ideal location for a greater range and density of uses. However, challenges persist in its re-invigoration. In the 1970s and 80s, much of Arapahoe Square was cleared to serve as a parking reservoir for the Commercial Core, specifically between Park Avenue, Welton Street and Broadway. It is still dominated by surface parking lots and some vacant parcels. The remaining buildings are both economically and architecturally diverse, combining urban lofts and low-rise neighborhood commercial with warehouses, transportation facilities and light industry. Many social service providers are located in Arapahoe Square. Light rail transit along Welton Street is attracting new residential development and provides connections between the Downtown core as well as Five Points and Curtis Park. Future FasTracks improvements include extending this line north along Downing and converting it to streetcar. Over the past several years the Downtown Denver Partnership, along with partners including the City of Denver and the Denver Urban Renewal Authority, have worked and advocated for land use policies and projects that have the potential to spur additional catalytic investment throughout the district. The Partnership served on the task force for new zoning which complements an updated design review process to help Arapahoe Square fulfilll its potential as Downtown’s next great neighborhood while aligning with the 2007 Downtown Area Plan and 2011 Northeast Downtown Neighborhoods Plan. The new system went into effect on August 23, 2016.